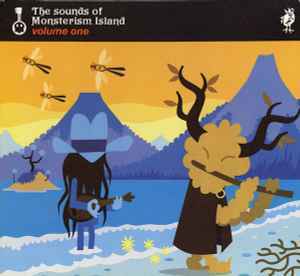 Logos of Pete Fowler, Monsterism Island, Forever Heavenly and EMI appear. ℗2005 The copyright in this compilation is owned by EMI Records Ltd. ©2005 EMI Records Ltd. This label copy information is the subject of copyright protection. Track 1: Since Music Publishing Inc. ℗ 1968 The copyright in this sound recording is owned by Sony Music Entertainment Inc. Licensed courtesy of Sony BMG Music. Track 2: Exotica Music. (From the Liberty Single F-55199 <a href="http://www.discogs.com/release/1482216">Martinique/Sake Rock</a>) 1959 (From the Liberty Album “<a href="http://www.discogs.com/Martin-Denny-Quiet-Village/release/1305182">Quiet Village</a>”-LRP-3122) 1961 ℗ 1959 The copyright in this sound recording is owned by Capitol Records Inc.
Track 3: EMI Blackwood Music , Blackwood Music Inc. ℗ 1968 The copyright in this sound recording is owned by Sony Music Entertainment Inc. Licensed courtesy of Sony BMG Music. Track 4: Island Music Ltd. ℗ 1969 The copyright in this sound recording is owned by Island Records Ltd. Music Corp. (Originally issued on the Liberty single “The Enchanted Sea”. Licensed courtesy of Universal Music Licensing. Track 6: Released by arrangement with BBC Music. Recorded for the BBC Radiophonic Workshop. ℗ 1967 The copyright in this sound recording is owned by BBC. Track 7: EMI Harmonies Ltd , Criterion Music Corporation. Digital Remaster. ℗ 1997 The copyright in this sound recording is owned by Capitol Records Inc.
Track 8: Acuff Rose Publishing Inc, Fifth World Music (BMI) ℗ 1968 The copyright in this sound recording is owned by Sony Music Entertainment Inc. Licensed courtesy of Sony BMG Music. Track 9: Uncle Doris Music Ltd. ℗ 1971 The copyright in this sound recording is owned by Decca Music Group Ltd. Licensed courtesy of Universal Music Licensing. Track 10: Floating Camels (SESAC). Licensed courtesy of Dead Meadow. ℗ 1968 The copyright in this sound recording is owned by Dead Meadow Partnership. Track 11: Copyright Control. ℗ 1970 The copyright in this sound recording is owned by Decca Music Group Ltd. Licensed courtesy of Universal Music Licensing. Track 12: Copyright Control. ℗ 1968 The copyright in this sound recording is owned by UMG Recordings Inc. Licensed courtesy of Universal Music Licensing. Track 13: Tutti Intersong Editions Musicales SRL, Tub Editions Musicales Soc. ℗ 1969 The copyright in this sound recording is owned by Universal International Music BV. Licensed courtesy of Universal Music Licensing. Track 14: Elcien Music Ltd (MCPS). ℗ 1973 The copyright in this sound recording is owned by EMI Records Ltd.
Track 15: Arc Music Corporation. Courtesy of MCA Records, a division of UMG Recordings, Inc. ℗ 1956 The copyright in this sound recording is owned by UMG Recordings Inc.
Track 16: Copyright Control. ℗ 1960 The copyright in this sound recording is owned by Rod Freeman Estate under exclusive license to RPM Productions Ltd.
Track 17: Carlin Music Corp. ℗ 1973 The copyright in this sound recording is owned by Mercury Records Ltd. Licensed courtesy of Universal Music Licensing. Track 18: Nadel Music, Frank Metis Music, September Music Corp. (Originally issued on the Liberty single “ The Enchanted Sea” #55212) 1959 (From the Liberty LP “<a href="http://www.discogs.com/release/399479">The Enchanted Sea</a>” LST-7141) 1959 (From the CD “Paradise” CDL-57307) 1990. ℗ 1959 The copyright in this sound recording is owned by Capitol Records Inc.
Track 19: Copyright Control. Licensed courtesy of Warner Strategic Marketing UK. ℗ 1960 The copyright in this sound recording is owned by WEA International Inc.
Track 20: Copyright Control. Licensed courtesy of Warner Strategic Marketing UK. ℗ 1967 The copyright in this sound recording is owned by WEA International Inc. Thanks to Rob Manley and JMJ. Jeff, Robin and Martin at Heavenly. Chris and all at EMI. Tom Barwick, Graham Erickson. Mentasm Crew. The Fowlers. SFA. Second hand records stores of the world and Monsterism Island selectors. Thank you. This CD is dedicated to Martin Denny 1911-2005. The CD comes with a Heavenly Ranger figure. Track 17 errata: Correct artist is the jazz rock oriented group "Manfred Mann Chapter Three" not the 60s pop group "Manfred Mann". Track title is erroneously given as "One Way Class" on the release which was corrected for the tracklisting of this submission. The title was published on the self-titled debut album "<a href="http://www.discogs.com/release/900666">Manfred Mann Chapter Three</a>" in 1969, not in 1973 as given here. The Chapter Three release credits only the person Manfred Mann as author. There is another version of this track available on the Manfred Mann's Earth Band album "<a href="http://www.discogs.com/release/1192643">Gorified Magnified</a>" from 1972 which credits also the co-author Peter Thomas.